I am finally ready to let these go. Here's how I'm doing berry bowls this year. I'm listing ten at a time as I have them. I'm not offering custom colors or groups. Trying to meet individual requests made me more than a little stressed last year and the year before. I'm trying to reduce the amount of crazy in my life this year. 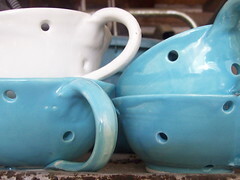 I've had several customer requests for saucers to go under the berry bowls. I'm going to begin making them this week. and should have them finished the week of May 1. If you want a saucer, please indicate your wishes in the buyer's notes and I will send you an extra paypal invoice to cover the cost of the saucer ($10, which will also include the bump in shipping). I do appreciate everyone's enthusiasm for these berry bowls. They (and you!) make a huge contribution to my family's financial well-being and even when I feel completely crazy during "berry bowl season" I never forget how much you help us. Thank you! Hi, just popping in to say that I have these four little bowls up over in the shop. Two are seconds, priced accordingly. A few nicks and bumps = $s off for you. The other two are near perfect. Not that anything is perfect, but you know. All four are 100% functional, and at least to my eye, lovely to look at, hold, and use. School starts so so soon. Little boy is at art camp this week so I'm sneaking in some studio time. Working on some new ideas. And old ones. I had a request for a mug in the speckled egg glaze, but I'm having a hard time with the shape. Delicacy is a must, but not so delicate you're afraid to pick it up and use it. Perhaps a handle-less form? But I won't attack this issue in full until after August 17. Until that time, the afternoons belong to the boy. Peach picking? check. Another round of blueberry picking? check. Weekend off to the lake- checking off this weekend. Afternoons of treehouse fun with friends- check, check, check. 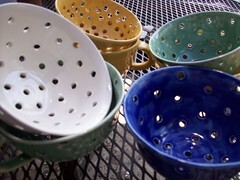 In "berry bowls", "home life"
I have finally, finally stopped opening the kiln to 50% berry bowl loss. 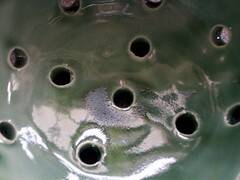 I've changed the piercing pattern to a single hole in the center and five holes right outside the foot of the bowl where it begins to flare up. I can't tell you how very, very happy this makes me. This last weekend I fired and hoped to have 17 bowls to finish the orders placed at the end of may. I got all but 7 shipped. Four need to be re-glazed and I have another dozen that will be ready to be bisque fired at the first of next week. I am aiming to have another batch ready by the last week of July. These four bowls all have glaze problems- there are spots that didn't get coated and you can feel rough clay through the glaze. I'll have them fixed and shipped next week. And I need to take more time with my glazing and make sure that the coats are nice and even. I'm low on several colors, so my next glazing session will be preceded by plenty of mixing and adding fixative to keep it mixed. Alchemy, this is. And YAY! The nikon's repair is under warranty. I hope to have my camera back soon. I miss it. A lot. a dozen berry bowls are up in the shop. Happy Wednesday! 90% of the first batch has been glazed and is in the kiln waiting to be fired. Tomorrow's listing (by 10 am CST) will include a dozen open orders and several custom orders for people who specifically wanted more than one bowl. I'll thrilled to have the first batch done less than 2 weeks from their order date and anticipate that the second batch will be finished in another 3-4 weeks. Maybe I'll be able to surprise you and get it to you sooner! If you don't make this round, I'll be offering a third round, as well. Thanks, friends, for your support and your patience. Hi, my name is Melissa, and I am a perfectionist. (Hi, Melissa). Yesterday I said that all of the berry bowls were fine. Um, they weren't when I actually unloaded them. Looked fine, but 3-4 (out of 10) had these tiny little hairline cracks radiating from the center hole. And I just about let these send me over the edge. So let's talk about perfection. A slightly crooked handle, okay. One side of the rim thinner/higher/thicker/ more curved than its opposite side? Er, well, it's handmade. Spotty glaze? Okay, I can reglaze it. Cracks? Those make me want to tear my hair out. Here's why. The glaze is glass, and it provides a protective barrier for all sorts of bacteria. In theory, bacteria can seep into this little bitty crack and contaminate the other food that it touches. So if you drank soup out of this bowl after rinsing something bacteria-laden (say, raw meat), you *could* get e coli (which, honestly, I've had before, and it was really really bad). But this bowl is for rinsing produce. So it should be okay. Neurosis speaks up again. If I sent this to a retailer and they noticed it, they'd send it back to me (and think less of my wares). And if it escaped their attention, someone bought it, noticed, and returned it, I would be at fault for sending defective wares. Do I wholesale these things? No. Regardless, it's going into my seconds pile. My solution (maybe, keep your fingers crossed) was to go online and buy a new hole punch. My old one is 6-7 years old and, admittedly, a bit worse for the wear. That is *probably* the cause of the problem. And it took me hours (and a whole summer's worth of duds) to figure it out. We learn as we go. Thanks for indulging me as I whine about miniscule cracks in something that isn't supposed to be watertight in the first place. We're half-way there to the long weekend! There is one berry bowl, in yellow, up at my etsy shop. It's a second, not quite perfect, so it is $18 instead of $20. Finders, keepers. More are coming! no more berry bowls. Except for 5 wet ones upstairs. The white one is mine because the rim is cracked. I had it filled with strawberries so people would have an idea what they were for. The green ones (spots and all!) were the first to go, then the blue, then the yellow. Several people dumped the berries out of the white bowl to buy it before I showed them the crack and refused to sell it. The funniest thing kept happening. Men (and only men) would come up, stare at the bowls, look at me, and either ask "how do you use this?" or, my favorite, "how do you drink out of this??" By the end of the day, I laughed and replied to the gentleman inquirer (this one was jesting) that only male customers were asking those questions. His answer was perfect. He told me that my reply should be this: "quickly." I do love a pithy answer. Even my cracked bowls have found happy new homes. I gave one to my favorite farmer (the cracks were visible only to me- probably in the glaze and not the clay), explaining that it was a second. My mom took one home (a blue one), my friend who took my apron picture has one. It seems like one or two more were parceled out, as well, and the last one, the white bowl pictured, is my display/personal use bowl. Market lessons learned: display bowl. I need a sign explaining how to use the bowls. More white bowls, more green bowls, more blue bowls, fewer yellows. I'll be back at the market in October- perhaps with grapes or late tomatoes in the display.